Former President Jimmy Carter discusses his cancer diagnosis during a press conference at the Carter Center on Thursday in Atlanta, Georgia. Guinea worm disease is a parasitic infection that people can get by drinking stagnant water that teems with tiny guinea worm larvae. The larvae can grow into three-feet long worms that eventually burst through the skin, causing great, paralyzing pain. I saw this a few times in Ethiopia; they can look like small serpents consuming a human being. The disease doesn't kill people, like AIDS or Ebola, but it makes life excruciating for children and adults, keeping from them school or work, making it difficult to eat or sleep. Jimmy Carter heard about the problem in the mid-1980s from a U.N. official he knew, who said he couldn't find any group to take on the lowly guinea worm. So in 1986, Mr. Carter got his Center involved. "We tackle problems that other people aren't addressing," he told NPR earlier this year. Carter Center workers — and often, Jimmy Carter himself — went to more than 26,000 villages with guinea worm cases. They helped organize programs to dig wells for clean water, and showed people how to filter water for drinking and bathing. There were reportedly 3.5 million people with guinea worm disease in Asia and Africa when the Carter Center, and its partners, began their work. Last year, there were just 126 cases. Politics is a rough business that can ridicule fine people. But at his press conference this week, people of all political faiths got a glimpse of Jimmy Carter's personal courage, grace and goodness. He told reporters, "I'm ready for anything and looking forward to a new adventure." His words may sound metaphorical for a 90-year-old man facing cancer. But he also has plans to go to Nepal in November to help build houses with Habitat for Humanity. He'd like to see the last guinea worm slither away. In many ways, he's enjoyed the most gratifying and valuable years of his life after what he sometimes calls his "involuntary retirement" when he lost the election in 1980. "I hope for the best and accept what comes," Jimmy Carter said. "I've had a wonderful life. I've had thousands of friends." 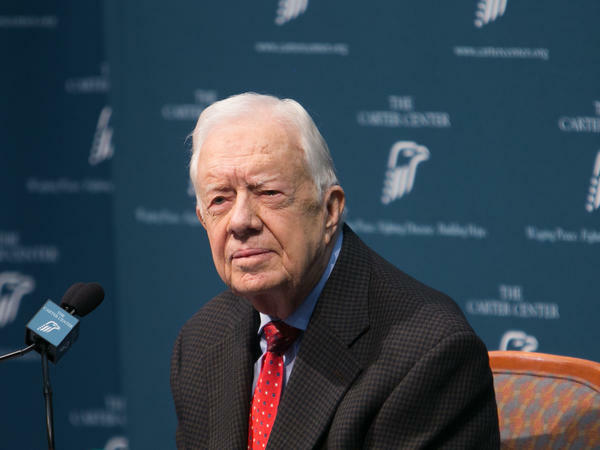 Jimmy Carter told a press conference he called on the morning of the day he would have the first radiation treatment on the cancer in his brain, I'd like for the last guinea worm to die before I do. Mr. Carter was frank, funny and graceful speaking this week about his health and his faith. But his remark about the guinea worm may have puzzled a few people. Guinea worm disease is a parasitic infection that people can get by drinking stagnant water that teems with tiny guinea worm larvae. The larvae can grow into 3-foot long worms that eventually burst through the skin, causing great, paralyzing pain. I saw this a few times in Ethiopia. They can look like small serpents consuming a human being. The disease doesn't kill people, like AIDS or Ebola, but it makes life excruciating for children and adults, keeping them from school or work, making it difficult to eat or sleep. Jimmy Carter heard about the problem in the mid 1980s from a U.N. official he knew who said he couldn't find any group to take on the lowly guinea worm. So in 1986, Mr. Carter got his center involved. We tackled problems that other people aren't addressing, he told NPR earlier this year. Carter Center workers and often Jimmy Carter himself went to more than 26,000 villages with guinea worm cases. They helped organize programs to dig wells for clean water and showed people how to filter water for drinking and bathing. There were reportedly 3.5 million people with guinea worm disease in Asia and Africa when the Carter Center and its partners began their work. Last year, there were just 126 cases. Politics is a rough business that can ridicule fine people. But at his press conference this week, people of all political faiths got a glimpse of Jimmy Carter's personal courage, grace and goodness. He told reporters, I'm ready for anything and looking forward to a new adventure. His words may sound metaphorical for a 90-year-old man facing cancer, but he also has plans to go to Nepal in November to help build houses with Habitat for Humanity. He'd like to see the last guinea worm slither away. In many ways, he's enjoyed the most gratifying and valuable years of his life after what he sometimes calls his involuntary retirement when he lost the election in 1980. I hope for the best and accept what comes, Jimmy Carter said. I've had a wonderful life. I've had thousands of friends. Thousands? I think it's quite a few more. Transcript provided by NPR, Copyright NPR.